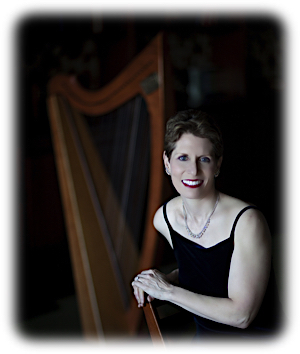 Get all the most relevant news about harpist Anne Roos in a downloadable press kit. Get the scoop about her participation in the 2015 Grammy® Award winning New Age Album, “Winds of Samsara”. Find out about her latest WeddingWire Couples’ Choice® Award. A quick bio, photos, and Anne’s upcoming public concerts are all contained in her press kits. • Download Anne’s GigSalad.com press kit—This is Anne's largest, all-purpose online press kit. Read relevant reviews, along with Anne’s bio and her latest news. • Download Anne’s Reverbnation press kit—This press kit is filled with songs that you can play and review. • Download Anne’s WeddingWire press kit—View this press kit to read reviews from happy couples and to learn about Anne’s wedding performance experience. Anne is as comfortable performing on camera and behind a microphone as she is performing in front of a live audience. She has a depth of experience performing on television programs and radio shows to play and talk about the Celtic harp. In interviews, Anne utilizes her extensive knowledge of music as a past classical, jazz and world music announcer for NPR (National Public Radio). Because she taught music appreciation for the Los Angeles Unified School District, Anne has a way of conveying music information that is informative, fascinating, and fun. To schedule an interview with Anne, contact her directly by email or by phone at 530-541-2575 (U.S. Pacific Time Zone). She’ll be happy to supply you with a complete performance resume, list of past performance venues, and links for music and video clips. Feel free to also reach out to her booking representative, Ed Miller, by email or by calling 530-525-5201.